The history of working people, and particularly Black workers, to organise is inextricably tied to the struggle against racism and national liberation. 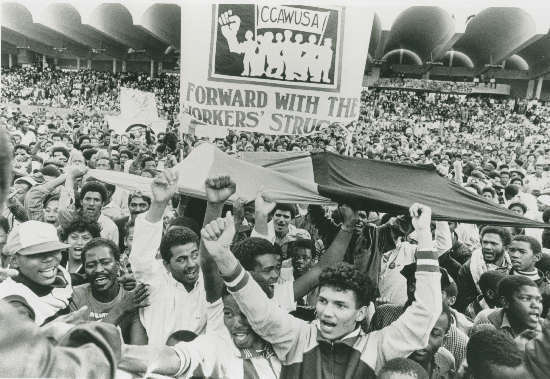 The roots of Trade Unionism and Socialism can be traced back to the vast influx of majority White workers who came to Southern Africa from across the globe in the search of fortunes and work in the wake of the discovery of diamonds and later gold. The story of labour is also the story of forced labour. A vast number of people were forced through intimidation, taxes, colonial and capitalist expansion to become wage labourers in White owned mines, industries and agriculture. It is also the story of the descendents of slaves, indentured labourers from Asia and the poor and prosecuted minorities of Europe, arriving in Southern Africa and joining Black working people in the fight for the right to a decent wage, equality, fraternity and freedom. This feature on labour will be regularly updated alongside features on Land, Migrant Indenture, Slavery and the Liberation Struggle. Labour struggles still continue today with the organised working class and the poor continuing to struggle to overcome the massive inequalities, unemployment and the economic, political and social legacies of apartheid.